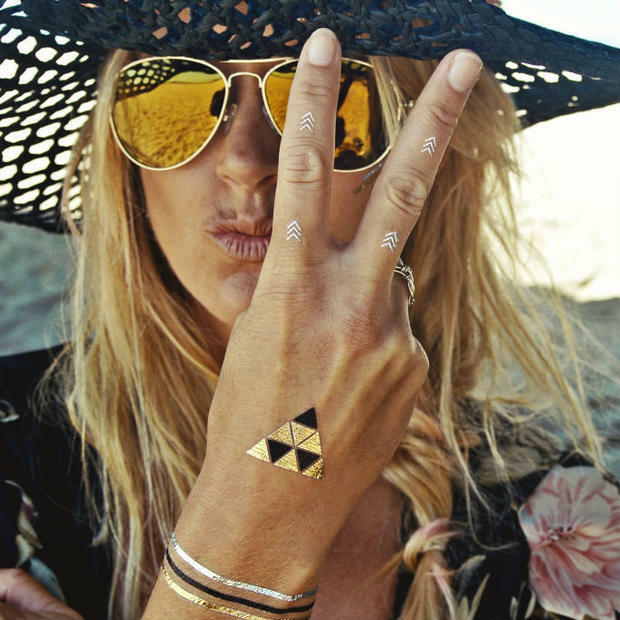 Fashion circles everywhere have taken notice of the enticing metallic temporary tattoo trend, and we can see why! These shiny stick-on accessories have become a signature look for festival goers. But their summery, playful vibe makes everyone want to rock them. 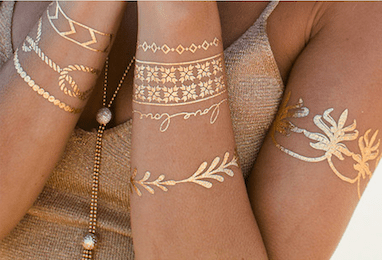 As with all trends, metallic temporary tattoo jewelry isn’t a brand new concept. In 2012, they were seen on models and made by Dior. However, these temporary tattoos were made of actual 24-carat gold micro-particles, so they were priced at $120 a set. The high price and the short life span didn’t make these tattoos appealing to the general public. But now that brands like Forever 21 and Nordstorm are carrying this unique body art at decent prices, everyone wants to get tatted up (temporarily at least). Although they aren’t permanent, don’t expect them to be like one of those temporary tattoo stickers you found at the bottom of a Cracker Jack box when you were a kid. These are durable enough to withstand days of fun in the sun and nights out with your bestie. Stick to being subtle when you start rocking this trend instead rocking a sleeve of tats or having a cluttered hand of tattoo rings. Focus on one body part at a time. Try a few dainty midi rings or a delicate bangle, and then go from there. 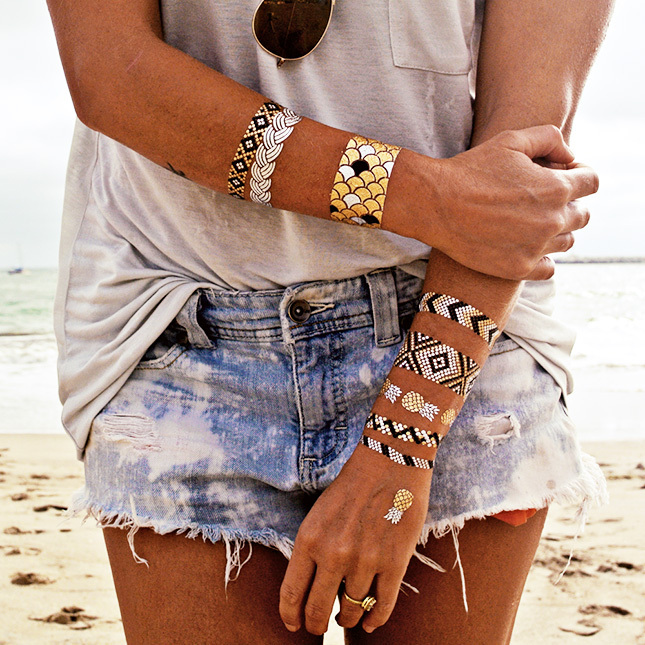 Just like real jewelry, you can pile on these metallic tattoos for a layered look. Get creative with your hands by incorporating tattoo rings with your real wings. It will give your ring stack a dynamic look. Larger tattoos like statement necklaces are a bolder approach to the trend. These stylish show-stopping designs look great when you’re sporting a swimsuit this summer. You don’t have to wear these metallic accessories as just jewelry. You can always rock them as body art, especially since they’re technically tattoos. The best part of this whole trend is that there’s no commitment or painful laser removal required. How do you feel about this trend? Would you try it?